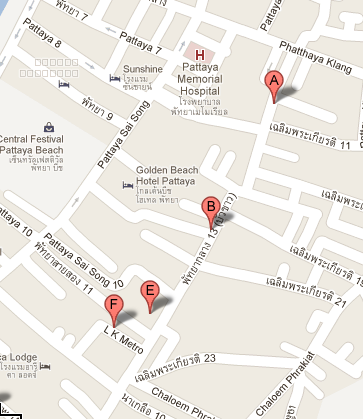 Want to find Pattaya cheap hotels? It will sure help you save money. After all - a room is a room and there are plenty of other things worth spending it on in Pattaya. But where can you go that will have good places for you to stay at fair prices? ...but where is this "mystical" street? Scroll down and you'll get a good idea of where to find this place that only most frequent "Patts" visitors know. Soi Bukao is where the 'B' is. That street goes parallel to second street (Phattaya Sai Song). It also connects to both Central road (Phattaya Klang) and South road (Phattaya Sai which isn't on this map). Coming from the beach? The beach is on the left side of the map. Just walk with your back away from the beach and and go one street further than second street. You'll notice a lot of hotels and guesthouses immediately. Coming from Walking street? Go to the entrance and walk inland with your back to the beach. Cross the second road intersection and after five minutes you'll see a temple to your left. Did you see it? Good you're on South road! Keep walking until you have the famous electronic store Tucsom to your right. On your left you'll see the beginning of Soi Bukao. How will you know you're on it? After a minute you'll notice a market on your right. It's open during the day but closed at night. I love this street. 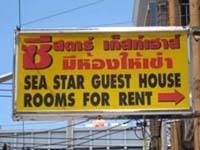 Not only does it have cheap Pattaya guesthouses but it also has a nightlife of its own. You also have food markets and bars too! It's a world of its own that I fear will only get more and more popular. In the meantime - enjoy the cheaper prices on everything while you can. See you soon in Patts!